Castle theatre, also known as "Zámecké Divadelko" (Small Castle Theatre), located in the ground floor of the West wing. Built 1796-1798 for the Duke of Valdstejn-Vartemberk (Waldstein-Wartemberg) at the site of a previous theatre (destroyed by a fire). Opened 23 Apr 1798 with a drama performance. Used for modern drama performances, performed by members of the ducal family. The original stage machinery by Vaclav Bonaventura as well as two original curtains and sixteen original stage sets by Josef Plazer (famous for his stage sets for the world premiere of Moazrt's "Don Giovanni" in Práha) survive until today. Since 1949 used for opera performances and concerts during the "Smetanova Litomysl" summer festival. 1991 inscription in the Unseco World Heritage list, as part of the Litomysl castle complex. 133 seats. 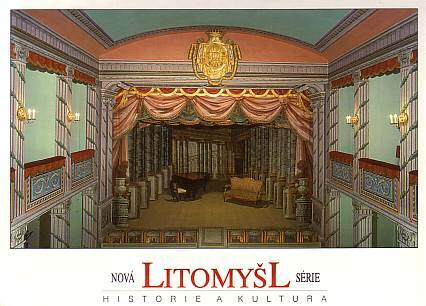 Front Text: "Nová - Litomysl - Série - Historie a Kultura"
Reverse Text: "Litomysl - Zámecké divadlo z konce 18 století - Castle theatre of the end 18th century"